Happy Easter all! I wish all the sugar shakes to my egg-hunting-champion-and-bday-twin Alex! 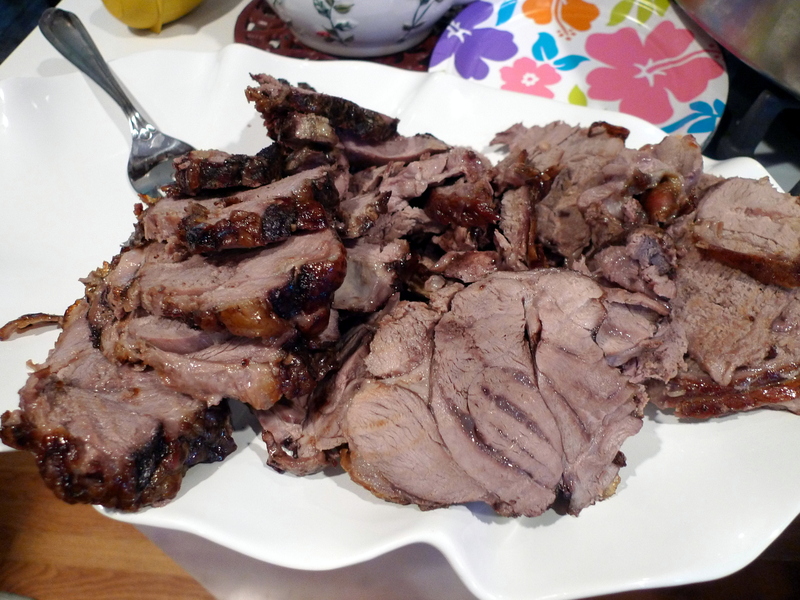 This Easter Sunday post is dedicated to the roast leg of lamb Alex’s mother cooked for us many years ago… and I am posting now out of nostalgia (not because I have actually tried to cook it myself but I did watch attentively if that counts?). 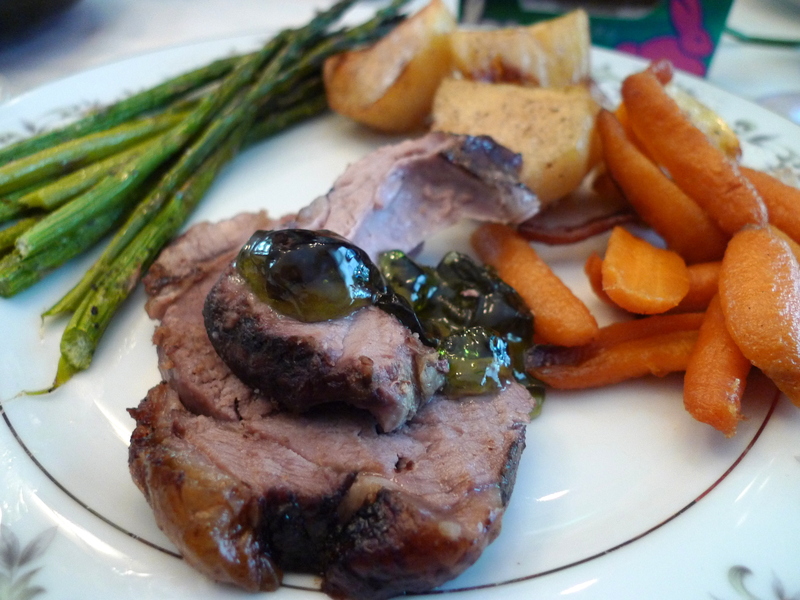 The roast lamb was with roasted potatoes, carrots, and asparagus that had been all basted with the lamb juices. And don’t forget a generous spoonful of mint jelly! It was one of my first proper Easter Sunday meals and it was everything I had imagined it to be. If you are using regular garlic cloves, halving them is good enough. Alex’s mom had some monster breed and thus chopping was required. 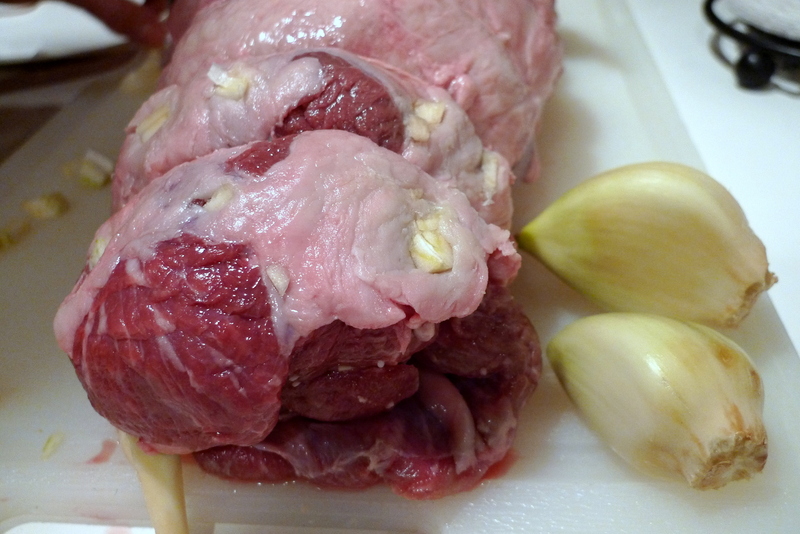 Make several 1/2 to 1 inch incisions all over the leg of lamb, particularly in the thickest parts of the leg. Insert a piece of garlic in each. It makes the lamb look a bit diseased but this step is completely necessary to ensure the meat is evenly flavored. Turn the leg over and rub 1/4 C of oil over the meat. Season generously with salt and pepper. Turn the meat back over and place on the rack. 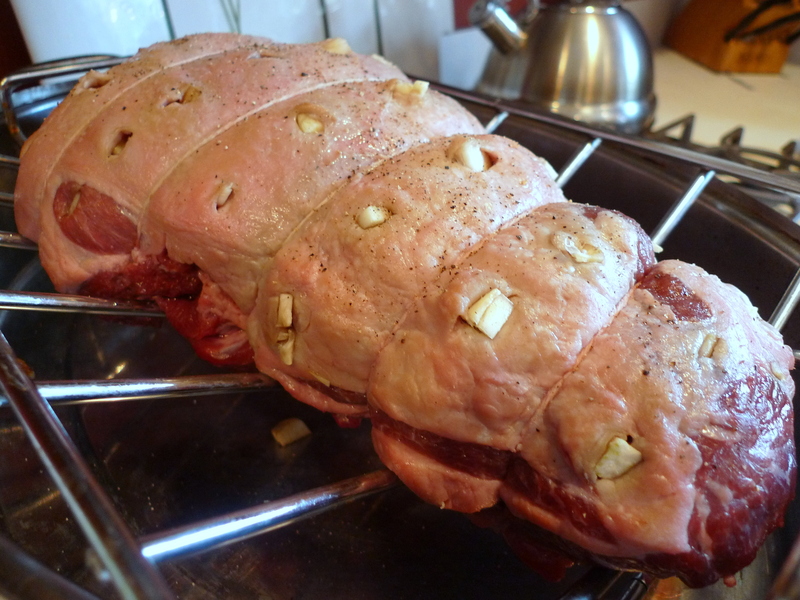 Rub the top of the roast with the remaining oil and season again with salt and pepper. 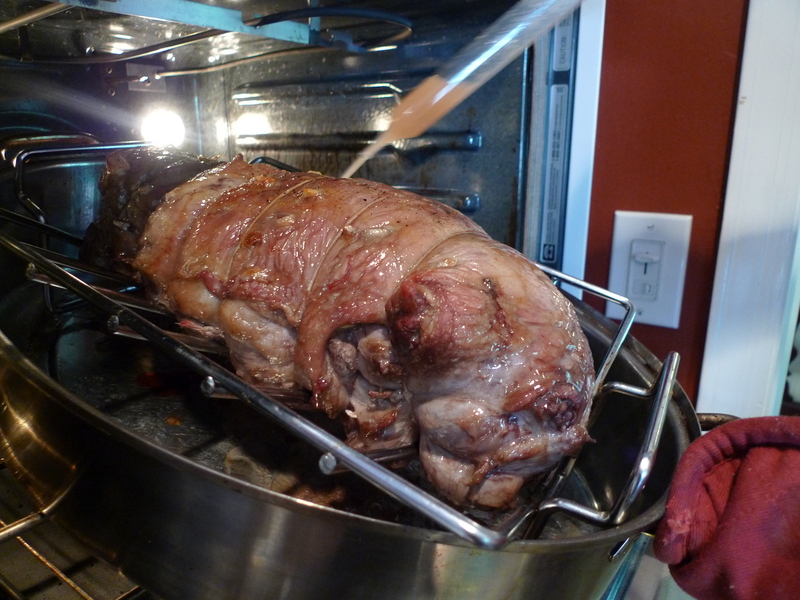 Let the lamb sit until it has reached room temperature (1 hour or so). Preheat the oven to 325°F (160°C). 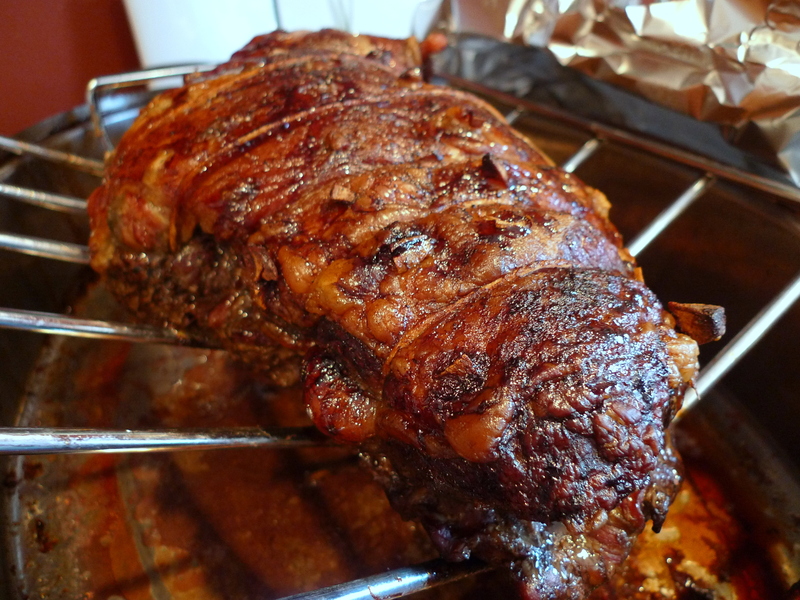 Put the lamb in the oven and roast for 1 hour, or 1.5 hours if you want it more well done. Rotate the pan even half hour and baste. If you are cooking vegetables with this (which you should be), place them in the roasting rack below to catch all the delicious lamb juices. Remove from the oven and let the meat rest on the rack for 45 minutes. Carve and serve with roasted vegetables and mint jelly.